Another delicious and exciting salad in which black beans are combined with various other ingredients is known as Black Bean and Couscous Salad. 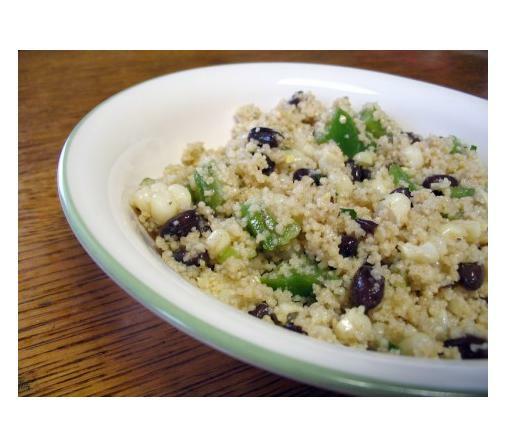 This light and healthy salad is a great dish to be served along with buffet, as it would double the taste because Black Bean and Couscous Salad has got interesting southwest flavours and textures. These fine features make Black Bean and Couscous Salad not only a tasty salad, but different as well. The method of cooking this salad is also simple and its preparation time is also quite limited so one can easily make it in short time. All they need is the complete list of Black Bean and Couscous Salad’s ingredients along with its recipe. Take the chicken broth and boil it either in a 2 quart or large sauce pan then stir the couscous. After that cover this pot and remove it from the heat then allow it to stand for five minutes. Bring a large bowl and whisk together lime juice, olive oil, vinegar along with cumin. Add red pepper, green onions, beans, corns and cilantro then, toss until it gets coated. Make sure that you must fluff the couscous by breaking up all the chunks. Then, add the couscous with the vegetables and mix all of them well. Afterwards sprinkle it with salt and pepper as per your taste or liking and serve right away or refrigerate to serve cold. Don’t Forget Breakfast on Thanksgiving Day!